If this film had been made shortly after the mid–‘80s publishing of Patrick Süskind’s novel Das Parfum, I’m sure it would not have been such an amazing cinematic experience. Not only is it one of the best serial killer movies of recent years, but also one of the most innovative period pieces. It is Paris in the 1800s. A young man, literally born into squalor and left for dead, leads a horrendous life - sold from the orphanage to slave away in a tannery. But, he has a very special gift. His sense of smell is so highly developed that he can pinpoint and isolate any fragrance emanating from anywhere, becoming like a sense of sight. While in the city delivering leather skins, a fragrance grabs his attention and entrances him. It is the natural scent of a young woman. He follows her to an isolated space and she freaks out - trying to silence her, he accidentally kills her, and with it her scent fades and disappears. Here begins his quest to capture human fragrance and harness it. It brings him in contact with an aging, once great perfumer. He creates the most incredible fragrances for the overjoyed profiteer in exchange for knowledge in the techniques for creating perfumes. This leads him to the French town of Grasse, where his experiments reach a psychotic (but successful) peak, each time costing a young woman’s life. The film’s denouement is a double-hitter with an incredible effect which I won’t dare give away here. 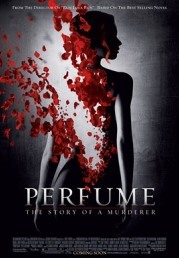 Marvelously acted, beautifully filmed and brilliantly executed, Perfume is a film not to be missed. The only way this great picture could’ve been improved is if it was in French and directed by Jeunet & Caro.